Last week, we organized our blog or business. This week we organize something that almost all homeschoolers have: a hobby. 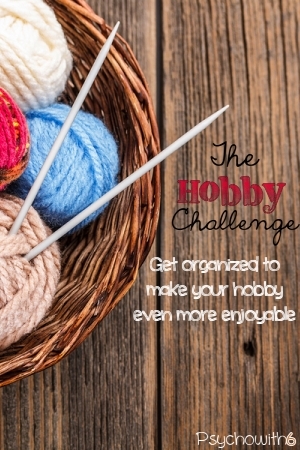 Whether you’re a crafter, a musician, or just a reader, this challenge is for you! If your hobby involves making gifts, this week is the perfect time to work on them as the holidays approach. If you didn’t read last week’s post or see the 1 Thing To-Do List I created, you may wish to read them so you can apply one-thing thinking to your hobbies. I’m a scrapbooker and it’s easy to become overwhelmed by all the photos and photo projects I’d like to complete. But I chose one thing to focus on and it’s my son’s school years scrapbook. I hoped to complete it by his graduation, but didn’t. Now my plan is to give him the book as a Christmas gift. Choose one project or priority to focus on that would have the biggest impact. Hint: Christmas can be a great motivator! If you’re a hobbyist and you’re reading this series, chances are good that you’ve accumulated too much. The clutter leads to paralysis. Every pile of materials leads you to think of something else you could be doing. 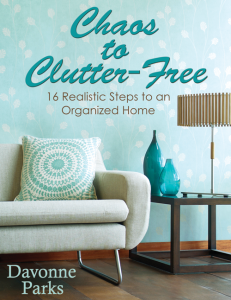 I just read the book Chaos to Clutter Free and loved it. It’s really motivated me! I think it will motivate you, too. As a scrapbooker, I went through all my paper and got rid of everything I didn’t love. It was amazing how much I still had left, but decluttering made me more excited about my hobby. I also got to bless a scrapbooking friend with what I didn’t need. By the time I am ready to use this, I will have other projects I’ll want to do. By the time I am ready to use this, it will no longer be timely or usable. If I decide later that I really want to use this, I can purchase it again. Once you’ve decluttered, organize your supplies in a way that makes sense for your specific hobby. Put like items together before purchasing organizing supplies. I organized my scrapbooking supplies into page kits in an over-sized three-ring binder. That turned out to be perfect for my son’s school years album. I pulled out any page kits that I thought would work for the album and it made my scrapbooking so fast and enjoyable. Consider organizing supplies by project, so you have everything you need for your top priority project accessible to you. Spend time looking for organizing ideas for your particular hobby. 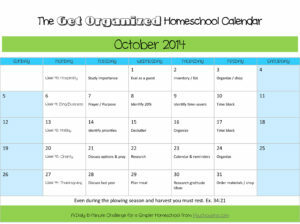 I will pin some ideas to the Organized Homeschool board on Pinterest. Once you have your supplies organized, you will want to make time to work on it. I have spoken to dozens of women who love to scrapbook like I do, but tell me that they haven’t done it in ages. The problem is that their hobby isn’t put on the schedule. I wrote about how I make time for scrapbooking every week. I have the added benefit of accountability because I have a friend who loves to scrap and is disappointed if I don’t keep my appointment with her. I had to do more time blocking to work on my son’s album and my friend’s 12-hour crop was the perfect opportuntiy. I had to resist all the other options that vied for that time, but I’m glad I did. I’m still not done with the album, so will time block to make sure it’s completed by Christmas. Put a time on the calendar when you will commit to working on your priority project and don’t let anything but emergencies interfere with that time. I’d love to know what hobby you want to organize this week!